Now, let’s take a look at what we’ve been up to over the past month (and a couple weeks…). The “random” battlefield generation that debuted awhile back immediately improved the way Crystal Companies is played. In the past few weeks, however, battlefields have only gotten more dynamic and “flavorful.” Not only is our lead dev a savvy coder, he also brings an interest/knowledge in eco-regions/biomes/geomorphology, which help to inform the procedures used to generate battlefields that look and feel “right.” Day/night cycles, weather, and more refined terrain generation are some of the big areas that were introduced this month. Since we drafted this post, we started to tweak aspects of how environments are generated—and folks noticed! Here are some of the highlights from the past week. Thanks for the retweet Unity! Thanks for the feature 80 LEVEL! 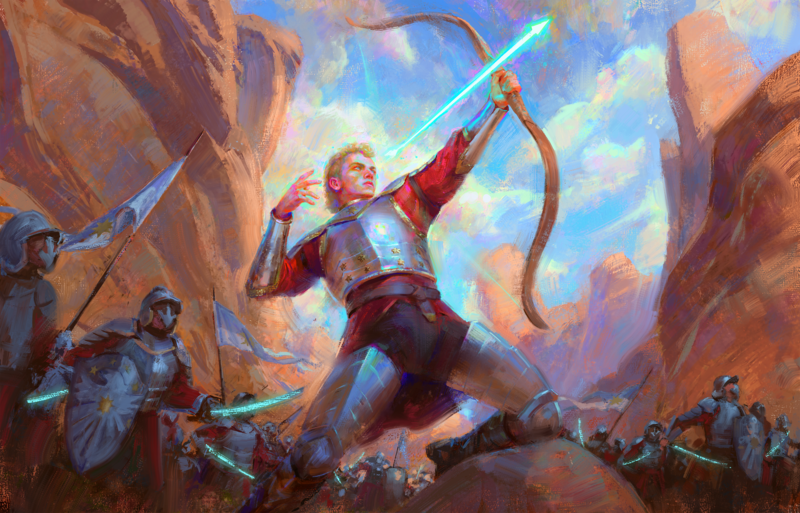 Marta Nael’s latest commission for Boreal Games and Crystal Companies pictures the blue captain, Traist, Prince of Hochraun, responding to a unseen foe (a Roc? an ambush?) while patrolling the interior of a canyon with his royal guard. In addition to having way too much fun improving the ways environments are generated, we also have streamlined gameplay and user experience in myriad ways, including a simplification of the resource system! Now only notes and crystal gathered from the environment factor into card costs. That’s all for now. Stick around our social accounts for the next month or two—it should be a pretty active time! It’s not quite fall, but things are coming together nicely as summer concludes. Not only are the procedurally generated battlefields improving daily, but the visual style of Crystal Companies is cohering nicely as well. Progress and plans for the future abound in this end-of-summer/beginning-of-fall update! This video shows some of the most recent developments on the map-generation front in Crystal Companies (of course, to see the very latest you should just get yourself a Steam alpha key from our Discord server!). Here are the latest results from Johnny Halcyon’s hard work! As usual, there were so many improvements this month–too many to mention here. 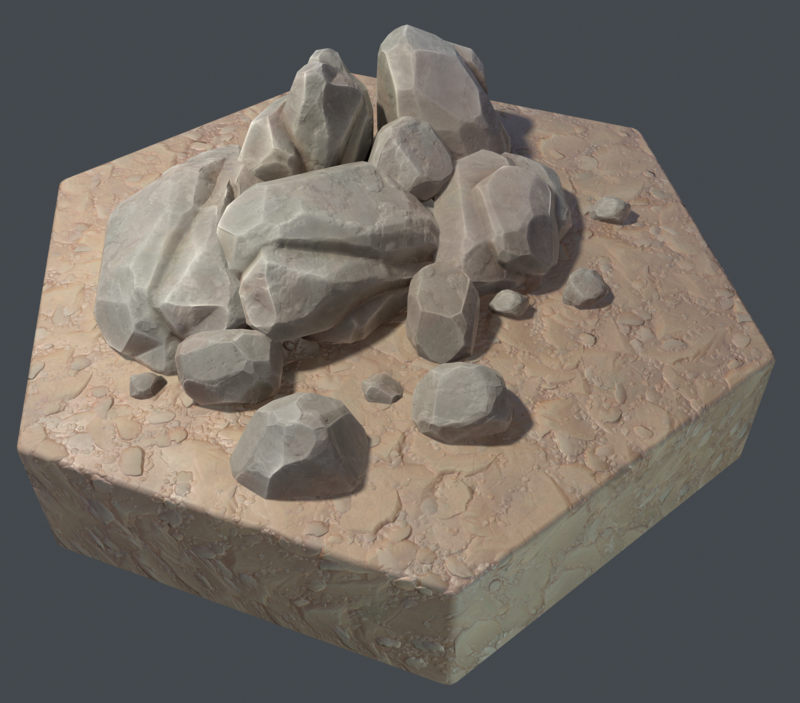 However, Brad’s devblog post catalogs them in detail here. The next month includes preparing for Granite State Comic Con (and probably a few more events that we will tell you about later!) and polishing Crystal Companies’ game mechanics and UX/UI. Both of these major initiatives should result in a smoother onboarding experience for new players and increased functionality across the game. Needless to say, these are exciting times! As an end note, don’t forget to like us on Facebook–where we’ve begun a new series called “Procedural Map Monday” wherein we post games played on procedurally generated maps–and follow us on Twitter, Twitch for Wednesday-night dev streams, and hop onto our Discord server to chat and/or get a FREE Steam alpha key!